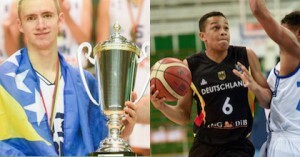 Dzanan Musa and Nelson Weidemann were two of the top players at the Adidas Next Generation Tournament in Belgrade. Taking The Charge Podcast Episode 181: We look at the Adidas Next Generation Tournament in Belgrade with the two interviews coming from that tournament as we chat with Dzanan Musa of Cedevita Zagreb and Nelson Weidemann of Bayern Munich/rent4office Nürnberg. Episode 181: We break down the ANGT Belgrade.